Atlas Shrugged, Ayn Rand’s didactic novel on the moral superiority of free markets, is flying off the shelves again. The Ayn Rand Institute reports that sales of the novel soared to 200,000 copies in 2008 and then a jaw-dropping 500,000 copies in 2009—not bad for a book that has been strafed by critical fire since its publication in 1957. Since we cannot attribute the stellar sales to literary laurels, we must turn to political reasons, which the Ayn Rand Institute, The Economist, The Cato Institute, and The Wall Street Journal are happy to present. The article in The Economist about the phenomenon provides a graph showing how spikes in sales of Atlas Shrugged coincide with lowered interest rates in late 2007, the election of President Obama, and the Emergency Economic Stabilization Act. For many conservatives, like Stephen Moore, senior writer for The Wall Street Journal, Rand’s libertarian-inflected novel reads like a prophecy for a political era in which, as Moore writes, “our current politicians are committing the very acts of economic lunacy” that Atlas Shrugged satirized. Ayn Rand’s novels, which use narrative as the delivery system of an explicitly political ideology, together with her nonfiction philosophizing form one of the intellectual pillars of Tea Party conservative populism, alongside the writings of Friedrich A. Hayek, Milton Friedman, and the Founders (or at least the Founders as read by Glenn Beck and associates). Contemporary conservatives often look to Rand et al.—rather than, say, Leo Strauss, Irving Kristol, or Normon Podhoretz, the once-admired neoconservatives upon whose principles the Bush Doctrine was built—for the tools to dismantle the rhetoric of “statist capitalism,” the Right’s enemy. Atlas Shrugged is a remarkably popular political tract that in the last fifty years has sold over seven million copies, 10% of which have been sold, indirectly we could say, by President Barack Obama. I suggest we will better understand contemporary political rhetoric if we analyze the persuasive allure of the tale of John Galt—master capitalist and avatar of contemporary American populism. I make this case in three moves. First, I will define populism as a rhetorical strategy best understood thematically rather than politically; in other words, populism, often associated with progressive-left politics, is a strategy without a partisan home, an equal opportunity storehouse for arguments across the spectrum. 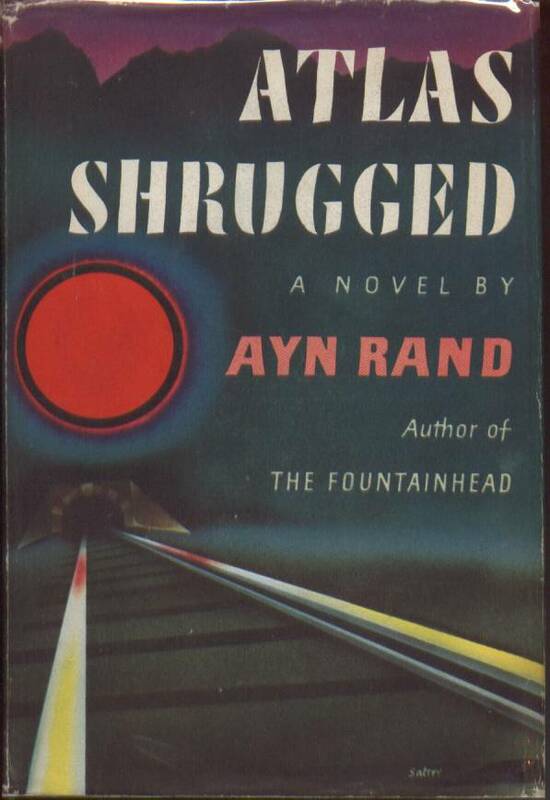 Second, I offer a reading of Atlas Shrugged, the novel that functions as the “gateway drug to life on the right,” especially for precocious teenagers (Burns 4). Though I don’t have room to analyze the entire novel, I will analyze one of the many synecdochic speeches Rand’s characters give in defense of free markets. In a world ravaged by government oversight, John Galt, renegade capitalist and leader of a secret band of elite laissez faire enthusiasts, preaches to a potential disciple on the evils of “the creed of self-immolation” (Rand 686). Since Galt’s theme is sacrifice, self-sacrifice specifically, I turn to Kenneth Burke’s notion of self-immolation to analyze how Rand turns the classical virtue of self-sacrifice into “the most contemptible evil” (Rand 445), thus perpetuating what Jeremy Engels calls “rhetorics of victimhood” (Engels 304). Finally, I argue that the popularity of Atlas Shrugged provides a timely moment for re-seeing novels as appropriate, even necessary, artifacts for rhetorical criticism. 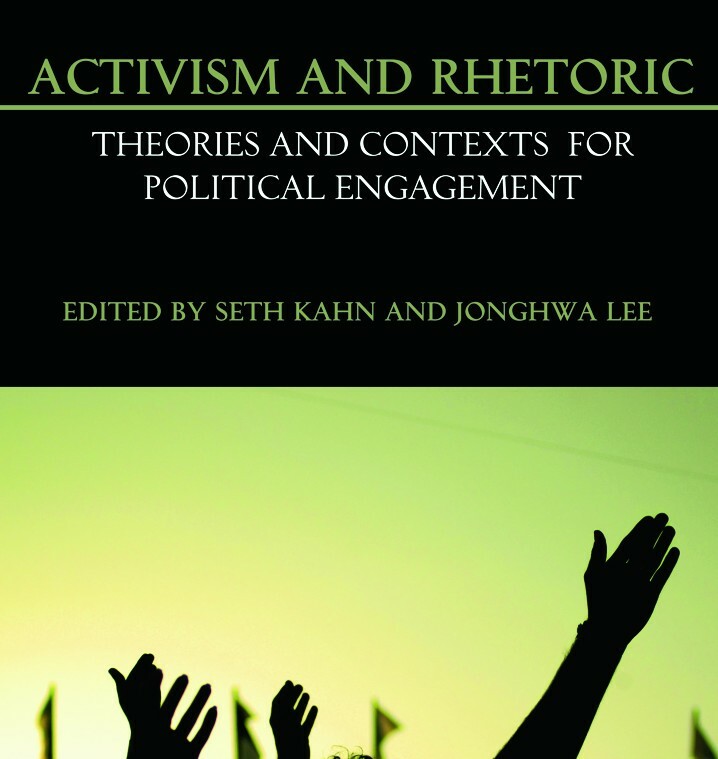 As proverbs writ large, novels constitute what Kenneth Burke called “equipment for living,” and as such they participate in the constitutive back and forthness of public rhetoric, sometimes even eclipsing public address or other symbolic political action in terms of reach and influence (Burke Philosophy 293). American fiction has a rich tradition of pamphleteering on behalf of the victims of an evil culture (e.g., Uncle Tom’s Cabin, The Jungle, Fahrenheit 451, etc.). Ultimately, as in Burke’s reading of Milton’s poem Samson Agonistes, we must see Atlas Shrugged as “literature for use”—in this case, literature that provides a liberating sacrifice typology for free-market conservative populists to see themselves as victimized saviors of a corrupt society (Burke Rhetoric of Motives 4). Much of the scholarship on populism focuses on the agrarian reform movements that helped constitute American progressivism before World War I.1 Participants in the early populist movement saw themselves as inheritors of agrarian virtue alienated from the post-Civil War “corporate order” (Kazin 28). They also believed that “state action” was the most effective “means to settle accounts with perceived enemies” like bankers and owners of railroads (Postel 17). In the late 1940s, however, populism migrated to the Right as anti-communist and anti-statist forces used populist tropes to oppose, rather than support, social change (Kazin 167). In part because of this dramatic shift, in recent years we have come to see populism and populist rhetoric as articulating more a mood than a specific political ideology—a “language,” as Michael Kazin puts it, intended to mobilize the “noble assemblage” of “ordinary people” against the “self-serving and undemocratic” elites (Kazin 1). We know populist rhetoric not by its political content but by “the pattern of arguments” it presents as a generic response to situations defined by crisis (Rohler 316). To be banal, populist rhetorics use populist reasoning. In his description of the “populist argumentative frame,” Michael Lee provides us with four attributes of populist reasoning: Populist rhetoric (1) invokes a virtuous people “portrayed as heroic defenders” of time-honored values (358); (2) identifies this rhetorically constituted people against a rhetorically constituted enemy “hoarding power” (359); (3) further compounds the enemy rhetoric by claiming to work against a “system” (like government or the economy) once virtuous but now “sullied” (360); and (4) expresses an “apocalyptic confrontation” or a “mythic battle” set in a political order on the verge of collapse (362). Running through these four strategies is a “narrative of victimization and redemption” that inverts the biblical soteriology by turning the congregation itself into the undeserving scapegoat (363). This rhetoric of victimhood is central to understanding the rhetorical situation of Atlas Shrugged as it provides aid and comfort to contemporary conservatives who see themselves as sacrificial victims of evil men and evil systems whose immoral incompetency is driving society to the edge of the abyss. After the Federal Government passed the Emergency Economic Stabilization Act in 2008 (the troubled assets bill) and the American Recovery and Reinvestment Act in 2009 (the stimulus bill) to stop what could have been a catastrophic market crisis, the Tea Party movement coalesced around a sometimes vague, but always visceral, discontent with government spending, government debt, entitlement programs, and health care reform. On the Tea Party Patriots webpage, the core values of the grassroots movement are bulleted as “fiscal responsibility,” “constitutionally limited federal government,” and “free markets.” These time-honored values, often framed in Tea Party rhetoric as the legacy of the Founders (with obvious references to the Boston Tea Party), constitute the doctrine of the Righteous in their moral struggle against the Wicked. This victimhood language is best understood logologically in the sense that it gives an example of what Burke called “usable secular analogues” to theological language (Rhetoric of Religion 2). Theological language provides certain topoi for secular discourse, the most dramatic one being the “sacrificial principle” by which a people seek a victim—a scapegoat—to carry off their sins through its own destruction. For Burke, this “‘curative’ role of victimhood” (Rhetoric of Religion 4) explains all kinds of cultural animosities, both real and symbolic, as various groups demonize, antagonize, and ultimately seek to destroy their enemies in a move to purge the world of evil. On a more abstract level, the “imagery of killing,” as described by Burke in A Rhetoric of Motives, is a principle of “transformation (‘rebirth’)” (xiii), a kind of poetic topos that provides motives and terms by which a “thing can be defined narratively in terms of its fulfillment or fruition” (13). Victims complete the order. Burke helps us understand how people use language to make enemies worth killing (through “matricide, patricide, infanticide, tyrannicide, or regicide,” and then finally “genocide” (Rhetoric of Motives 13); but we also learn something about the victim’s rhetoric. 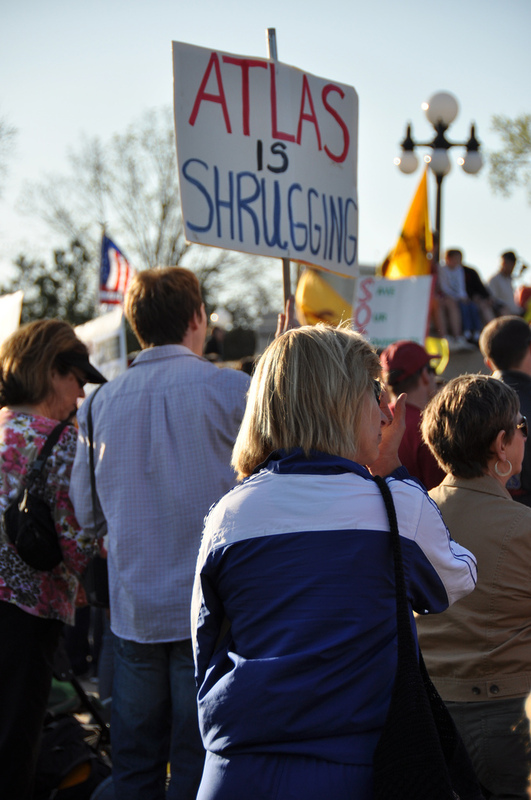 Resentful times call for a “politics of resentment,” as Jeremy Engels argues in a recent article on the Tea Party (305). When “resentment is constitutive of civic identity,” citizens see themselves primarily as victims whose only recourse is unhinged hostility at “a purported cause of suffering” (Engels 306, 322). Unlike the sacrificial lamb who goes to the slaughter in obedient silence,2 the victim in this case resents its victimhood and lashes out at the victimizer. Again, this argument gives Tea Party populists the rhetorical strength to “shrug” off their role as sacrificial animal in the name of a self-evidently rational ethical code of self interest. Hank Rearden, the novel’s promethean iron magnate, speaks for Rand and her contemporary populists when he identifies as “the most contemptible evil” on earth society’s demand that the wealthy “immolate” themselves like “sacrificial animals” through the redistribution of wealth (Rand 445). In Atlas Shrugged, Rand sets up a (melo)dramatic victim narrative inside which contemporary conservative populists can affix themselves, with righteous indignation as the adhesive. She cleverly subverts the typology of the theological victim—e.g., the sacrificial lamb or Jesus Christ—by making the act of atonement a vile injustice rather than the instrumentality by which justice is restored. Atlas’s majestic shrugging is the ultimate revenge fantasy for those who believe the government and all those who support market intervention have demonized the most useful, creative, and productive members of society. Atlas Shrugged is riddled with long-winded speeches by characters who seem to have read Atlas Shrugged. The longest of these speeches is the 54-page sermon by John Galt near the end of the novel, but he gives a much shorter warm-up earlier on, when his secret, idyllic hideout of free market geniuses is discovered by Dagny Taggart, a railroad executive and Galt’s future lover. This speech, like the others, works as synecdoche for Rand’s larger argument about free markets. Galt explains to Taggart that the men who have joined him at Galt’s Gulch are on strike. The useless men of the world have used the strike in the past; now “the men who have carried the world on their shoulders, have kept it alive, have endured torture as sole payment,” the greatest minds who endure the greatest social limitations, will walk out on the world. “This is the strike of the men of the mind, miss Taggart,” Galt explains. “This is the mind on strike” (Rand 677). Without the strike, the very best of society—the most pure and worthy and necessary, the lambs without blemish, the sinless ones—gets massacred by those who need them most. By contrast, the oblivious victimizers, like the Roman guards at the foot of the cross, know not what they do. Controlled by “dark emotions” rather than reason, the mass of humanity rises in power, having fatted themselves on goods and services they did not produce. Once the victims and victimizers are set in dramatic relief, Galt turns preacher to explain how “the creed of self-immolation” works (686). Again, in spite of Rand’s trenchant atheism, or perhaps because of it, this rhetoric of victimhood must be read within “the dialects of theology” as a commentary on atonement (Burke Rhetoric of Religion 10). Galt invokes the atonement topos by arguing that Atlas is made “to accept the part of a sacrificial animal and, in punishment for the sin of intelligence, to perish on the altars of the brutes” (678). 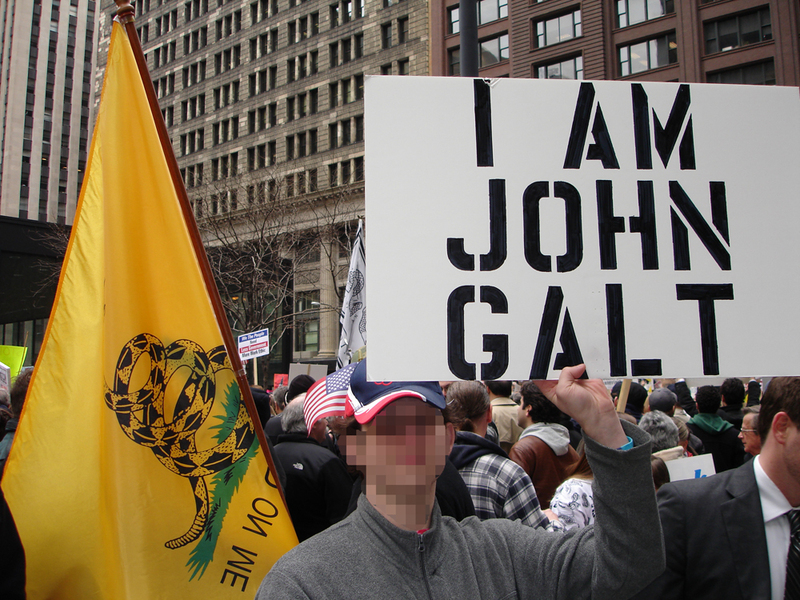 Atlas Shrugged is a forceful political narrative because it enrages and empowers the victim. Galt’s capitalist heroes, who have historically atoned “for the guilt of ability,” are now preparing themselves to step off the grid and let the grid collapse in an earthquake of ineptitude (679). Take away the victims, says this logic, and civilization is impossible. In Rand’s fantasy, the political economy collapses as the unwashed and unworthy step in to replace the army of Atlases who have removed their services. This rhetoric of victimhood takes its audience beyond rage and into pseudotheological self-congratulation. Contemporary conservative populists can see themselves not only as society’s victims but as their saviors who, like Jonathan Edwards’s God, hold society over the abyss by sheer will. By the end of the novel, the victims have become the victors, and Galt and his gang go back to the world, having conquered their enemies—not, as Constantine did, by the sign of the cross but by “the sign of the dollar” (1069). “Fiction is a much more powerful weapon to sell ideas than nonfiction,” Rand argued in 1944. That same year she called herself “the chief living writer of propaganda fiction” (qtd. in Pierpont 70). Literary theorists often speak of the “intentional fallacy”—that you cannot understand a novel by its author’s intentions. As literary critic Thomas Mallon puts it, Rand seems to believe in the “intentional imperative,” meaning that good fiction somehow requires its author to pamphleteer for moral principles (Mallon 66). Though no literary scholar I know would go as far as Rand does, we can at least agree, with Burke, that one function of fiction is indeed to make arguments about values. Though leading scholars in rhetorical studies have made this case in the past,4 we have not yet made studying literature a regular part of our criticism. 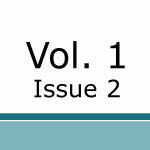 Recently Jeffrey Walker argued that rhetorical poetics, though often not directly deliberative, provide through imaginative expression the value system that makes deliberation possible (Walker 4). If this is the case, then we must attend more regularly to those cultural artifacts that tell stories, like film and fiction, especially when those artifacts contribute implied arguments about the values undergirding democratic culture. Considering the popularity of right-wing political thrillers like Glenn Beck’s The Overton Window, published in 2010, and the novels of Brad Thor, we must more carefully analyze the way conservative populism uses fictional narrative to demonize competing ideologies. Rhetorical theory gives us useful tools to situate literary texts in public debates and to help readers of such texts “become rhetors,” as Rosa Eberly argues so effectively in Citizen Critics (9). In the case of Atlas Shrugged, a bestselling novel has become scripture for contemporary conservative populists in their quest to identify themselves as victims and fight a polluted, bloated system of meddling government. The novel lets them see themselves as John Galts, imbued with political righteousness, ready to shrug off the government’s burdens through collective action. Whatever your opinion of Rand’s work, that kind of rhetorical power forges strong political identities—and, of course, animosities. Hence, we cannot engage with the emerging political order without understanding Ayn Rand’s unhappy populists and the rhetoric of victimhood. Booth, Wayne C. The Company We Keep. Berkeley: U of California P, 1989. Print. Burke, Kenneth. The Philosophy of Literary Form. 3rd ed. Berkeley: U of California P, 1973. Print. —. The Rhetoric of Religion. Berkeley: U of California P, 1970. Print. Burns, Jennifer. Goddess of the Market: Ayn Rand and the American Right. New York: Oxford UP, 2009. Print. Eberly, Rosa. Citizen Critics: Literary Public Spheres. Chicago: U of Illinois P, 2000. Print. Engels, Jeremy. “The Politics of Resentment and the Tyranny of the Minority: Rethinking Victimhood for Resentful Times.” Rhetoric Society Quarterly 40.4 (2010): 303-25. Print. Erlich, Howard S. “Populist Rhetoric Reassessed: A Paradox.” Quarterly Journal of Speech 63 (April 1977): 140-51. Print. Goodwyn, Lawrence. The Populist Moment. Oxford: Oxford UP, 1978. Print. Heller, Anne C. Ayn Rand and the World She Made. New York: Nan A. Talese, 2009. Print. Hofstadter, Richard. The Age of Reform. New York: Vintage, 1955. Print. Kazin, Michael. The Populist Persuasion: An American History. Rev. ed. Ithaca: Cornel UP, 1998. Print. Lee, Michael J. “The Populist Chameleon: The People’s Party, Huey Long, George Wallace, and the Populist Argumentative Frame.” Quarterly Journal of Speech 92.4 (November 2006): 355-78. Print. Mallon, Thomas. “Possessed.” The New Yorker, 9 Nov. 2009. Print. Moore, Stephen. “Atlas Shrugged: From Fiction to Fact in 52 Years.” WSJ Online. The Wall Street Journal, 9 Jan. 2009. Web. 15 Sept. 2010. Pierpont, Claudia Roth. “Twilight of the Goddess.” The New Yorker, 24 July 1995. Print. Postel, Charles. The Populist Vision. New York: Oxford UP, 2007. Print. Rand, Ayn. Atlas Shrugged. New York: Signet, 1996. Print. Rohler, Lloyd. “Conservative Appeals to the People: George Wallace’s Populist Rhetoric.” The Southern Communication Journal 64.4 (1999): 316-22. Print. Walker, Jeffrey. 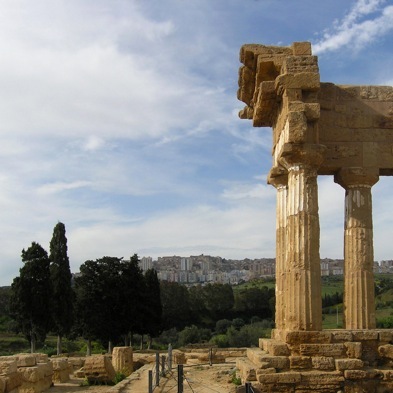 Rhetoric and Poetics in Antiquity. New York: Oxford UP, 2000. Print. 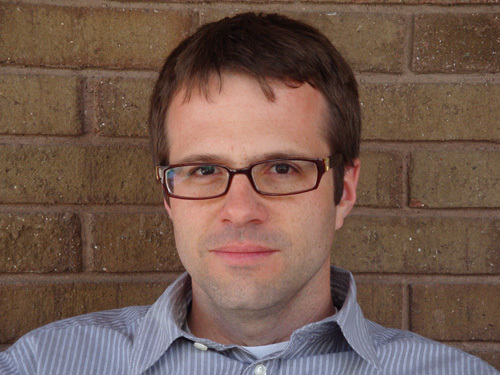 Brian Jackson teaches rhetoric and writing courses at Brigham Young University where currently he serves as associate coordinator of University Writing. This is an impressive essay: thoughtful, well written, well argued. I think you’ve got things about right, unfortunately. Burke is well used. My reading of Ayn Rand is that capitalism means the separation of government and business. In Rand’s novel government controls businesses, whereas today businesses are controlling government. In reality the victims todays are people who have invested in fraudulent securities guaranteed to be of high quality by business. Also, the victim is democracy because business men are buying congress men to do their bidding. Businessmen can be good or bad. They are good when they are creative and bad when they are fraudulent. I’m an Objectivist so I have some disagreements, but this essay has many good points. Rand indeed does have a populist streak within her; if only more of Rand’s critics realized that (the usual criticism is that she’s an elitist poisoned by hatred of ‘the people’ – Barbara Branden’s biography of Rand shows that this was not the case, she had great respect for the common man). I do have to outline some disagreements. First, you have used some loaded terminology which shows a lot of disdain towards the novel. For someone that argues “this book needs to be analyzed irrespective of your opinion of it” that is unfortunate to see. Second, you identify Rand as a Conservative. She was actually an ideological libertarian/classical liberal, and she had nothing but hatred for the conservative movement (her essay “Conservatism: An Obituary” is a good reference). Now, I suspect that you’re using the term “Conservative” to refer basically to the coalition of different ideologies which forms “the non-left,” but at the very least you could have separated Rand and libertarianism generally out from, say, Straussian Neoconservatism, Religious Conservatism, and Oakshottean Conservatism. Additionally, you classify Atlas as “right-wing,” which again might have validity if you define “the right” as “the non-left,” but it still seems hard to classify Atlas as right-wing when libertarians themselves usually consider themselves neither right nor left, Rand herself didn’t consider herself either right or left, and the book attacks Christian morality with unprecedented ferocity (oh, and Dagny does have that underage passion with Francisco, and she does engage in an affair with married man Hank Rearden, and she has no desire to raise a family). Third, you say that Atlas Shrugged cannot owe its popularity to “literary laurels.” However, many of the world’s most popular forms of fiction are considered to be artistically substandard. In many ways, this is itself a populist theme; the standards of the literary elite vs. the standards of most readers. I do think The Fountainhead is better than Atlas, but Atlas needs to be judged for what it was. It was intended, from day one, to be a relatively clear polemic. It wasn’t a character study, it wasn’t meant to be about “real people” in “real situations” (its somewhat telling that many authors and publishers seem to define “real people” as “non-virtuous people riddled with insecurities”… apparently it is them that hold a lot of disdain for the “common man”). It was meant to basically explain Rand’s philosophical thought in a way that was accessible to people that weren’t academic philosophers. I think that Atlas accomplishes its own goals very competently. I will say one very interesting point you make is how Rand deliberately plays with the traditional Christian narrative (i.e. a Messianic Archetype character sacrifices themselves for people much less worthy than themselves, with this being presented as a noble and heroic act). I think you are right that it is BECAUSE of Rand’s atheism that she inverts this narrative. So, whilst I have reservations, this was an interesting read. David, that’s an interesting inverse of the standard critique about “socialism”: What do we call it when business controls government? Either way, I think Rand would be an enemy of our system. For all her trenchant commentary, she believes, fiercely, in fair play. She would have a dim opinion, I think, of those massive corporations who lobby the government for all kinds of interventions. Studiodekadent, thanks for your even-handed critique! You’re spot on about the conservative thing. Now that the tea party has more fully united with the evangelical conservative base, maybe we should be more cautious about identifying it too intimately with Rand. Yes, I categorize Rand as right-wing because popular language about political ideology would put non-interventionism on the right. Your comment makes me think that folks like Rand are political outliers who won’t feel at home with either major party. Thanks, too, for pointing out that polemic literature need not be “literary” to do its job–a valid point. I have to say, though, that having waded, very patiently, through Atlas, through a thousand plus pages of 8-pt font of the same trenchant message over and over, I think its flaws overcome its strengths. In the end, I did not enjoy the reading experience. Her editor was a push-over. The book would have done its job just as well in half the space. However, I think her satire of the incompetence of bureaucracy is strong, even funny at times. Thanks for your reply. My apologies for how slow this reply has been. You’re right that popular language defines free market economics as “right-wing.” However, Rand was also for the legalization of drugs, which is popularly considered “left-wing.” She was also an atheist and secularist, which is also popularly considered “left-wing.” So even on the basis of popular language it is hard to consider her “right-wing.” Additionally, your essay uses a lot of relatively technical language relating to literary theory (my intellectual background is in economics and philosophy, so what would strike you as relatively casual terms about literature tends to strike me as highly technical Lit Crit stuff), so I do think you alternated between casual and (relatively) technical terms, thus creating an inconsistent tone. That said, thank you for acknowledging my comments and agreeing that it is mistaken to identify Rand as part of the Conservative movement. You are right that the majority of Randians (and libertarians broadly) are not particularly comfortable being affiliated with either major party, although there are some exceptions. I also think you should know that this essay is noted on The Atlas Society’s “Myths About Ayn Rand” website and is considered to be propagating the myth that Rand was conservative. Here’s the link if you’re interested: http://www.atlassociety.org/atlas-shrugged/myths-about-ayn-rand (see the right hand section called ‘perp walk’).